Green Mountain Timber Frames http://www.greenmountaintimberframes.com/ measured this barn before they dismantled it to use its frame anew. Due to the wood used - poplar, beech, hemlock - the layout and the construction we think this barn was built by a farmer without an extensive background in framing. We think it dates to the 1830's. The floor was dirt, the head room under the hay loft not quite 6 ft.
What was it used for? Sheep perhaps? Sheds, windows and a silo were added over the last 180 years, making the original purpose hard to read. I start with the farmer. He had some wood of a certain size and length he could use for posts and beams for a barn. He knew how the barn would be used and where it would go. Probably he had a carpenter square - they were readily available. But maybe not, as his dimensions don't quite fit. And he was much more comfortable with the old-fashioned geometry of the 'whirling square'. He could have started with a string about 18 ft. long. He could have used a compass with a 27" radius, stepped it out twice for 4'-6", twice more for 9' and doubled that for 18'; or a pole 4'-6" long. In his square he laid out his center lines and then the star that joins the points - the second and third diagrams. 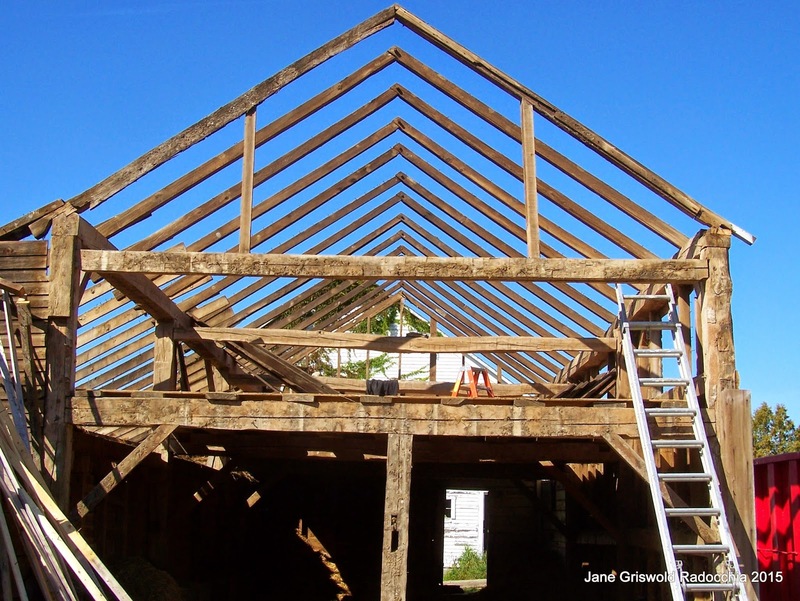 This is a medieval framing system which came to New England with the English colonists. I have added circles to mark how the lines of the star cross at the locations of the girts, I've added a green dashed line to show how the height of the wall is 2/3 the height of the end wall. Almost. It's off by 2"
Using a carpenter square to layout a 3/4/5 triangle does not work as well. The wall height isn't high enough. The lower girt can be determined - see the green circles - but not the upper one. While the frame appears governed by the traditional English framing geometry, the frame itself has dropped girts - a Dutch traditional way of framing. The girts are mortised into the posts below the upper beam. This combination of framing methods is sometimes referred to as 'American'. The floor plan is simple: three 3/4/5 triangles. If the width is 18' the length should be 40'-6" . It was 40'-2" measured on site. 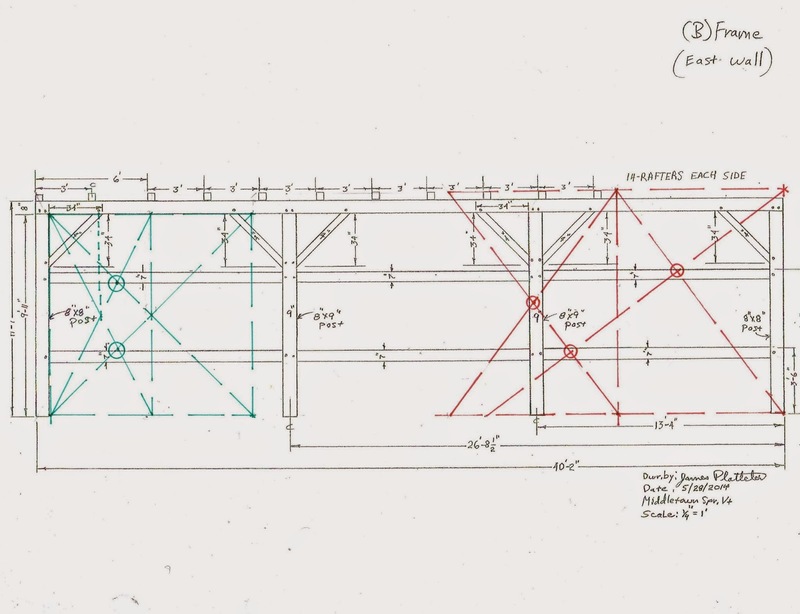 The men repairing the frame tell me it is 40'-1"; that the 2 interior bents are at 13'-4 1/2" from each end. 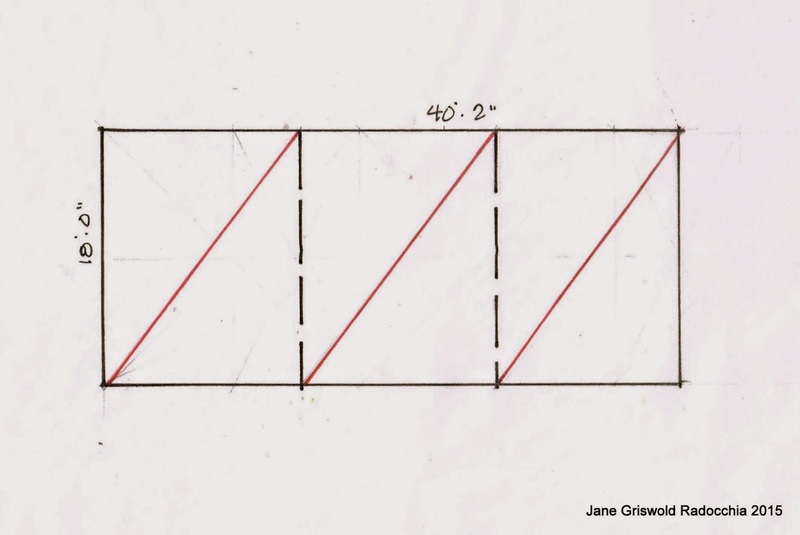 If one arm of the 3/4/5 triangle is 17'-10", the other is 13'-4 1/2". 3/4 of one side of a 17'-10" square = 13'-4 1/2". 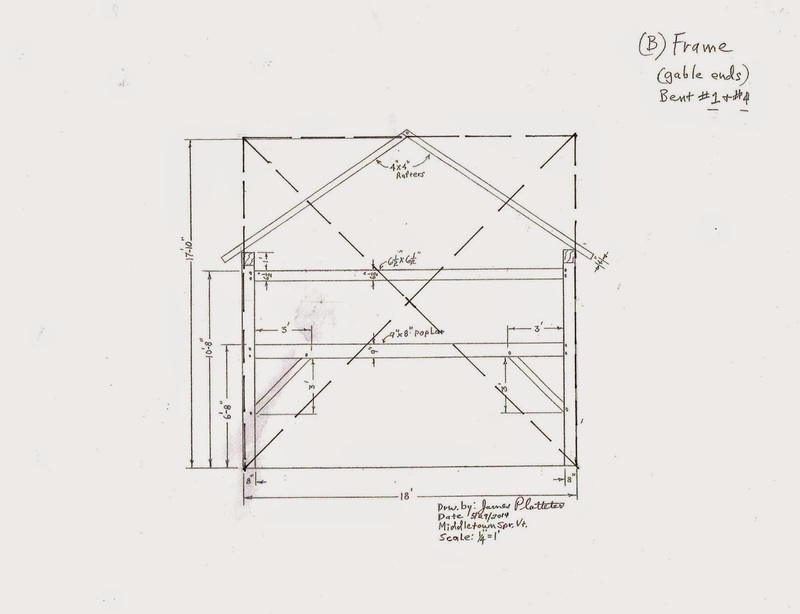 So either framing system fits the floor plan. Dan McKeen, GM Timber Frames, also tell me 3 girts are beech, one poplar.The top plates are poplar and in good shape. The posts are sawn hemlock and hewn beech. The ties are sawn hemlock. I looked at how did this farmer/framer laid out his girts in the side walls. Here I tried - on the right in red - 3/4/5 triangles. 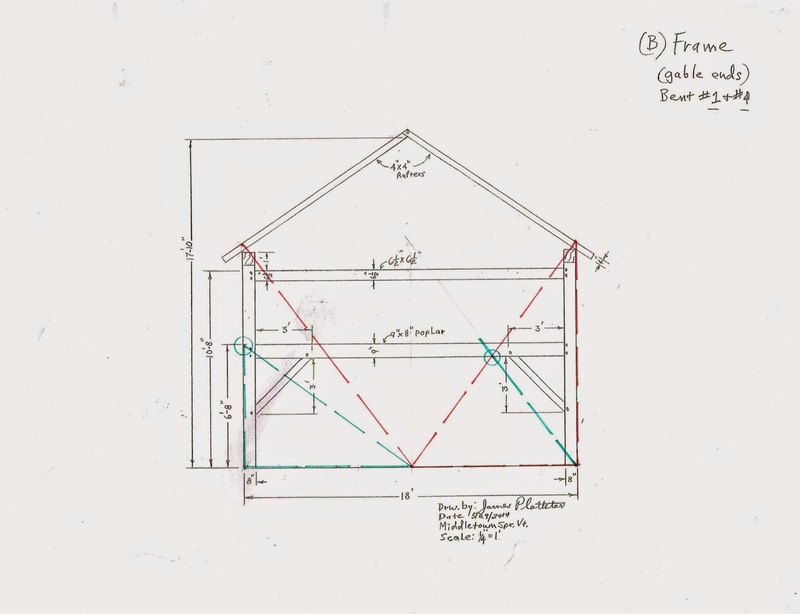 The intersections - red circles - using a triangle that includes the rafter tails, are close, but convoluted. Not simple. However, a square laid out inside the frame - on the left in green - neatly divides the space in thirds - green circles. The star of the square used for the gable end laid out along the side also notes the placement of all the girts. The numbers on the early carpenter squares were engraved by hand. It is possible that this farmer/framer owned a square that was very slightly off. Or he used his own measure. The man who built this frame comes alive as I study it; I've met him. Now I want to ask how he learned to frame - who taught him? what tools did he like? where did he start? were we right about his choice of materials? As a traditionally trained Barnwright, I think you do a marvelous job "interpreting" these vintage timber frames. It is hard to say if this was the farmer that did the work of a near by apprenticing Timberwright/Barnwright. Often the Master Wrights of a region would become too in demand to fill all the orders and would facilitate (let) those he may be training take on such commissions. It appears this frame is more a Dutch/French influenced frame than English, or as you put it "American." The English systems did come up here yet there is debate over whether they or the French-Germanic systems dominated. The "inch" of 1830 was whatever the Barnwright or local Sawyer said it was, and not standard at all...but more a rough approximation. I work in metric so find many of these frames actually fitting that system well even though it did not exist. Though some Barnwrights may well have used a 10th system of measure in their layout over a 12th system. Squares too where locally made by either a Smith or more commonly by the Wright themselves and out of wood commonly. Hope to catch you down at Dan's sometime...We could have a coffee and just talk. I like your idea of the framer being an apprentice. Yes, the frame is Dutch/French influenced, but the geometry is English. The last barn I blogged about used the daisy wheel. This one doesn't. I don't know why the framer used a 'divided square'. I wish I did! When I did the math I saw that the 2" difference between 18' and 17'-10" was so small - about 1/10" per foot! And yet the framer used that dimension consistently. It was not a mistake - it was his length, as you said, his standard. It is well possible that the Farmer, a Son, or other relative, was an aspiring Timberwright. Just as those that taught me took on the young folk around them with an aptitude for such endeavors. Many farmers and their families had additional skills that was part of the family business, and network of community Artisan/Crafts People. Hmmm....I am not sure I would call the geometries used in the barn and other architectural layout modalities necessarily "English." Labeling it such suggest that the British Isles is the "root orgin" of these layout methods, and it is not. I am, very much, a student of the roots of vernacular architecture...particularly that of timber framing. I love the many different styles, and early on became fascinated with its evolution and root forms. Historical architectural geometries and awareness of the "golden section," as well as, all the other dynamic forms of geometry used in the layout of timberframes (be they ship or terrestrial architecture) appears to have its roots "squarely" (couldn't help the pun) in the Middle East. From this region it appears to have spread East millenia before spreading into Europe. From the "Zafimaniry timber framing traditions" to those of the "Kath Khuni" the root methods and their distribution are Middle Eastern with a focus on the Nile Valley and Eastern Mediterranean. In very convoluted and roundabout ways, the methods present in the U.K., today and historically, are mostly Germanic/French in origin of there refinement as applied to timber frame traditions, with many of the vernacular root forms we recognize today coming with the Romans when they occupied most of Europe and the British Isles. Prior to the Romans, with their advanced mathematics and architecture, we only had the Celtic and Hiberni cultures. These cultures did possesses a solid understanding of the use of stone and celestial geometry, yet the forms we see take form later in their timber frames and other architecture appear to take a foundational root in vernacular form of development from Europe via the Eastern Mediterranean and the Middle East. The "daisy wheel," "square" and many other forms where first used by the Roman and other Middle Eastern Cultures, perhaps thousands of years before they spread into any organized fashion of application in Europe. Other than the 3,4,5 the "divided spare" is the most common and basic forms. 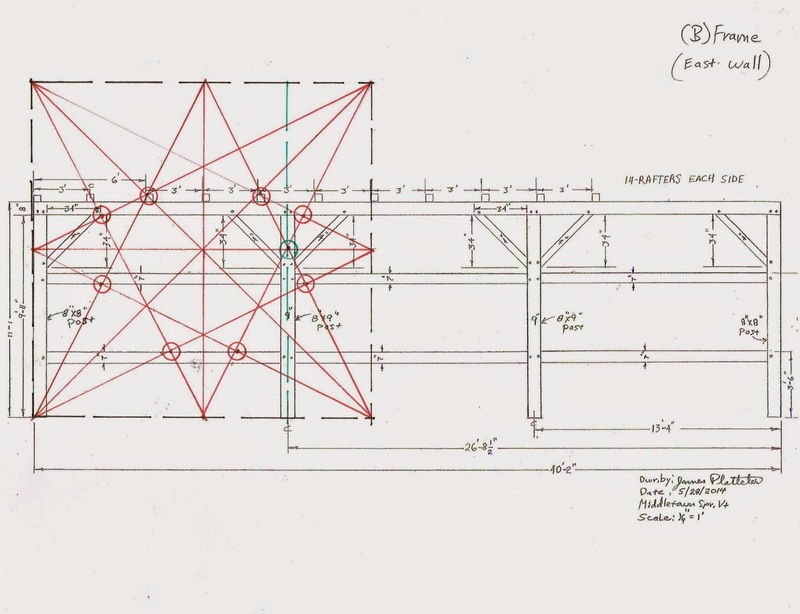 This is why I think (and you picked up on also) this was probably a 'beginning endeavor' for the Barnwright that designed and facilitated the frame in question. I can also suggest that often "on site" discesions for layout became pragmatic in orgin and once applied to the "story pole" it became "rule" for laying out the frame. Jay, I don't disagree with you at all. But in my research I have found that the English settlers in New England used the divided square ( see my posts on the Parson Capen House and the French Andrews House, both First Period New England) while the Dutch in the Hudson River used the daisy wheel (see The Van Alen House).Both used the 3/4/5 triangle for expansions. I do not find framers using the Golden Section - that surprised me. All the geometries cross, have similar proportions at certain intersections. I look for the ones that are 'spot-on' - the simplest thing the framer could do. In this post I drew how the 3/4/5 triangle could have been used. I think it wasn't - not neat enough, easy and clean enough. "Square layout" is a root form in itself, with the Daisy Wheel, Pentagram, and other forms all fitting comfortably inside it. Even the 3,4,5 is inside the Pentagram, which in turn fits inside Square Layout accordingly. I also feel that the further we get away from the more refined designs of the House Wright's craft and into Barn Wrighting, often the more pragmatic the designs become. In this, the "geometry" is a guide and not often as stringently followed. The lack of close adherence to the Golden Section within barns and other agronomic structures further reflects the more pragmatic drive behind these structures. Yet...if the 3,4,5 is present, then the pentagram is there as well, and so too the elements of "square layout," which all hold within them the golden section... it is just more obscure in application and not a focal point in the design. More there out of coincidence than intent.